The departments of English, History, and Political Science have been offering numerous courses with a broad southern focus for years, and in some cases, decades. Consequently, students in each discipline often take several of these courses, thus creating an unrecognized and unofficial specialization in the American South. In order to formalize and organize this practice and to maintain the high quality of the curriculum, the respective departments propose an interdisciplinary minor in Southern Studies. We propose that the minor in Southern Studies be administered by the Diane D. Blair Center of Southern Politics and Society and will be overseen by an interdisciplinary committee representing the departments of Political Science, English, and History. Committee members will be selected by the Director of the Blair Center in consultation with the Departmental Chairs. The Blair Center, established by an act of U. S. Congress in 2001, was intended to promote interdisciplinary scholarship, but it does not include, at this point, an undergraduate component. 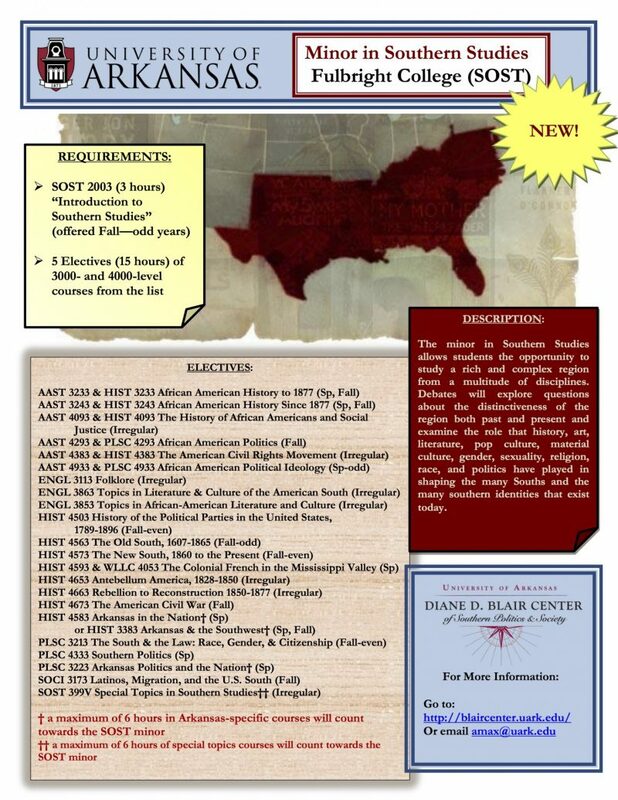 Thus, this minor in Southern Studies would connect students with the resources of the Blair Center and it would reflects the academic model of its namesake, Diane Blair, who, in her own research and teaching examined the undercurrents of politics, history, and culture that shaped the South over time. All courses included most focus specifically on the South as a region. I am a senior honors student majoring in English literature and minoring in political science. I would have very much been interested in a Southern studies minor, as that is what my thesis will cover and is also what my courses have been focused on. I have taken courses on the South in both literature and in political science and feel that the minor would have been beneficial to me in helping me specify my future research and job searches. I sincerely hope this minor will one day be an option for students such as myself who have similar interests in the distinctiveness and cultural heritage of the South. I am a former student of the University of Arkansas. I graduated in May 2012 with a B.A. in English and a minor in history. Before coming to college, I never knew there was such a thing as “Southern Studies”. Being from a small Mississippi town close to Oxford, we’d had our fill of Faulkner, but no one had ever presented him or any other Southern writer in any spectrum other than a part of the larger literary canon. However, some of the best classes I took in college were those “Southern Studies” classes-Southern Literature classes as well as classes on the History of the South. Before entering the M.A.T. program here, I even considered coming back for a Master’s degree in Southern Literature, so something like a Southern Studies minor could be very beneficial to student like me who would like to know more about the culture around us and the history from which it comes. It is something that I feel would have enriched my education and could do the same for current and future University of Arkansas students. I am a senior political science major. I wish that the southern studies major would have been offered when I was declaring my major. It is an important part of American history that should not be over looked. There is no doubt that I would have declared for a Southern Studies minor if it was offered. It would have enjoyed every minute of it. Heck, I would consider coming back and getting that minor. It would be so much fun. After taking the class Southern Politics, I had a deeper understanding of how culture, history, and economic development created the complicated political atmosphere of today’s South. By examining this familiar atmosphere, I have since been able to recognize and analyze the complexities of other political systems. My focus as an undergraduate has been international relations, but it is clear that Southern Studies topics such as the Civil Rights Movement, one-party politics, and social justice would have resonated beyond their southern context. I am finished this December with both history and political science majors. The minor would have really complemented my studies and hopefully will open the opportunity for more Southern history and political classes to be offered. The South was my primary focus during my undergraduate career and I took as many courses I could that covered the various aspects of the region and its history. Having been a born and raised Southerner, I loved the South but took so many of its quirks for granted as simply a way of life. The courses I had with professors such as you and Dr. Jeannie Whayne helped me better understand the complexities of the South, many of which I had never before considered, and even deepened my love for the South and pride that I was part of its rich and intricate history. I believe a minor could promote a better understanding and appreciation of the South and its eccentricities among students like myself who grew up surrounded in the culture as well as students who have moved into the region for school and have little idea about the South beyond stereotypes. It could also motivate students to take courses outside of their major that deal with the South and offer a stronger and better rounded understanding of the South through the eyes of different disciplines. I wish that I could have minored in Southern Studies. I think a Southern Studies minor would be an incredible asset to the university because it would be promote meaningful thought and discussion to the issues and historical context surrounding our region, community, and lifestyle. I took a class with Dr. Maxwell called Southern Politics in Literature and it contributed greatly to my understanding of behaviors in the South. I am disappointed that as a senior I will not be able to pursue a Southern Studies minor to go along with my Political Science major. It would be an interesting and beneficial addition to the offered curriculum. I would have jumped at the opportunity to minor in Southern Studies through the University of Arkansas given the chance. The various courses I have taken about the South currently offered through Fulbright College have led me to develop a great appreciation for the culture, history, and politics of the region. Even more so, I have come to learn through those very classes that the South is truly a distinct place worthy of its own academic field. I think the University of Arkansas, especially as an institution rooted in the Southern tradition, would enhance the breadth of study for those students interested in understanding more about the people and way of life in the South by adding a minor in Southern Studies. I wish this could have been an option for me! I’m a senior journalism major. I will be graduating without a minor but have taken more than necessary social science classes. If there had been an option for Southern Studies, after taking Politics and Literature of the American South, I would have been greatly inclined to pursue a minor in Southern Studies. I am a senior, majoring in Political Science w/ co- major in African American Studies. As things stand now I am will not here when this minor is made available, but I would have been very interested in this minor. I think this is an important minor because the South is an important part of this country’s history. I think that a person cannot completely understand this country’s history with understanding the South. The South is the rebellion region of this country. I think it’s important to understand why this is? Lastly, I think that the future of this country rest in the progression of the South. I think that this minor should be added to catalog not just for sake of diversity, but most importantly because it is a needed essential to the understanding of American History. I am a senior majoring in Political Science. Of all the courses I have taken in my three and a half years here, Southern Politics has been my favorite by far. I also thoroughly enjoyed my Arkansas Politics class. Had a Minor in Southern Studies been an option for me, I would have done it without a doubt. The South is a clearly distinct and interesting region, and if I ever get the opportunity to continue my education beyond my undergraduate degree, I would love to spend more time studying the history and politics of the South. I truly wish that UA had considered a Minor in Southern Studies sooner. I would have loved to have the option of a southern studies minor. I am a Junior Political Science and Communication major with a deep interest in southern politics, law and literature. A southern studies minor would provide undergraduates the opportunity to study the area they are achieving their degree from. I would have certainly declared a southern studies minor my Freshman year. My Southern Politics class is my favorite class I have had at the University and it really helped me understand more general ideas such as American Politics and the Republican Party. A Southern Studies minor is a fantastic idea! With Southern Politics being my focal interest in political science, I would have loved to pursue a minor in southern studies as an undergraduate here at the UofA. I am a junior now, studying political science and communications. Due to the lack of opportunity for such a study focus, I have since pursued a minor in criminal justice out of interest for criminal law. Had southern studies been an available minor, however, I would have much rather enrolled in its courses. The studies coincide with my majors, and preferred interest of political science.